The Aboriginal Peoples Television Network (APTN) described it as “the most formidable obstacle now faced by the condo project” in an article on November 26. Description: A handmade picket sign with the words “Free the Falls! 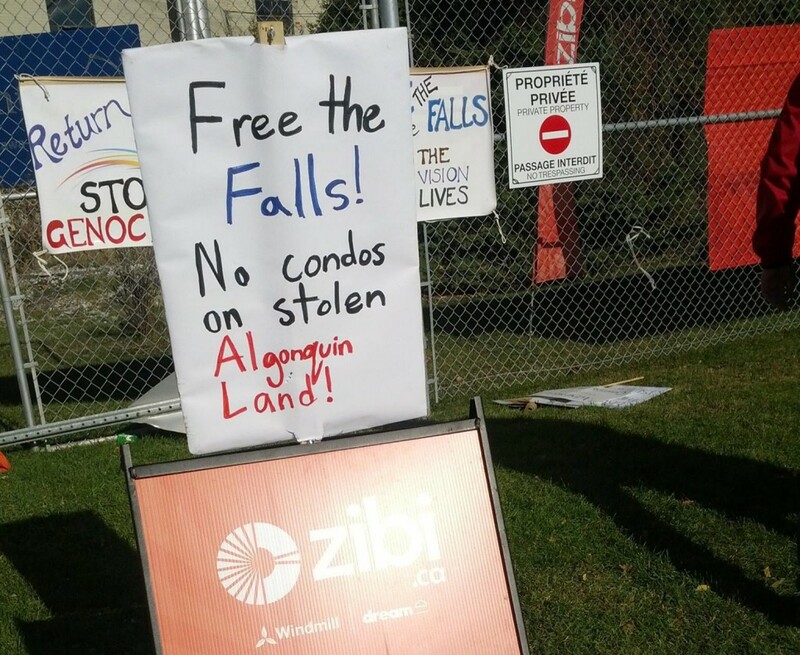 No condos on stolen Algonquin Land!” sits directly on top of a corporate orange Zibi logo sign. It was on that day that APTN, preceded a few hours earlier by FreeTheFalls.ca and EquitableEducation.ca, broke the news: the Assembly of First Nations of Quebec and Labrador, a 43-member organization including nine Algonquin chiefs, had passed a resolution to protect the sacred Algonquin site, Akikodjiwan (a.k.a. the Chaudière Falls area), in downtown Ottawa/Gatineau from the proposed Zibi condo development planned by Windmill Development Group Ltd. In the following days, the only further coverage was republication of the EquitableEducation.ca story on three websites – mediacoop.ca, rabble.ca and IntercontinentalCry.org – along with a follow-up story on APTN. The local mainstream media (CBC, The Ottawa Citizen, The Ottawa Sun, Metro News, and The Ottawa Business Journal) were all silent on the issue. With plans to make the area public – including a park and freed falls – in existence since the 1950 Greber Report and, in recent decades, the transformative vision for the site brought forward by late Algonquin leader William Commanda, this brings to mind a previous development situation Ottawa residents faced with some similarities. Culminating five years ago, the proposals for re-developing Lansdowne Park saw community opposition and possible alternatives sidetracked by both government and media. Instead, well-connected corporate interests were fast-tracked and sole-sourced to become the commercial and condominium reality now in existence at that site. Carleton professor Randal Marlin wrote a 2010 editorial on the Lansdowne situation in the Global Media Journal: “Propaganda, Ethics, and Media—Political and Commercial Erosion of Journalism Ethics” (in Vol.3, No. 2 at www.gmj.uottawa.ca). “The most disturbing aspect of commercial intrusion into the media comes at the point when … the news and opinion columns become promotional rather than critically evaluative of commercial developments arguably pitting public against private interests,” Marlin wrote. Marlin noted the controversy at the time around journalist Maria Cook. “The Citizen unceremoniously shut her down by pulling her off the urban affairs beat and suspending her blog,” wrote the editor of The Canadian Architect. This was in the lead-up to the city’s vote on Lansdowne, after Cook had written critically of the corporate development plans. Incidentally, it was right around the time she won the Royal Architectural Institute of Canada’s Award for Architectural Journalism. “Certainly, there were instances where opposing voices found expression in the paper, but timing, placement, depth of argument and frequency all play a role, along with photographic and other imagery,” Marlin also wrote. With the Algonquin chiefs’ resolution having been brought forward at the Canada-wide Assembly of First Nations meetings December 8-10 here in Ottawa, what will the local media’s response be? Given that kind of prominence, perhaps the question won’t be if the media have covered it, but how. What kind of impression and perspective will readers and viewers, many less than fully knowledgeable on issues around indigenous rights, be left with? The resolution cites articles of the United Nations Declaration on the Rights of Indigenous Peoples (UNDRIP) and states that both Canadian law and the international indigenous human rights of the Algonquin peoples are being violated in this situation. An earlier call by four of the Algonquin chiefs, in October, to protect the sacred site also cited recommendations of Canada’s Truth and Reconciliation Commission (TRC). The new federal Liberal government has promised to implement and honour both the TRC recommendations and the UNDRIP, so it remains to be seen if they actually will in this case, and also if the media will alert and inform their audiences on these fundamental issues. Wiliam Commanda’s vision for Asinabka is truly transformative: Indigenous and peace-building centres at the sacred heart of Canada’s capital, and true harmony with the environment at this most special site – all vital elements in these troubled times if we are to move forward in a better way. Or will Canada’s history of colonialism continue, with non-native visions of “progress” imposed upon long-standing indigenous values of spirituality? As already seen here, community and alternative media will be a valuable means of ensuring these kinds of things are made clear and prominent as the situation develops. Coming together in person is another way: there will be a panel discussion on this issue on Saturday December 19, noon-2pm, as part of the Phil Ochs Festival at Southminster Church (15 Aylmer Ave at Bank St) in Old Ottawa South. Future updates and events will also be posted at www.FreeTheFalls.ca. *Note: The author of this article, Greg Macdougall, also wrote the above-mentioned article posted on EquitableEducation.ca, which is his website. What an excellent article by Greg McDougall. Why aren’t the media picking up this most egregious error of almost every level of our governance, complicated as it gets? It’s a slap in the face to most Alonquin who are trying to build their nation and regain a fraction of what has been lost through colonial incursions into their territories. There is a chance to reconcile in a tangible and creative way–a win-win situation for all concerned. Journalists should be getting on board, and the quicker the better. Journalists really have no freedom of speech. The question should be, “what do the owners of Post Media, who hire and fire journalists, expect to gain from this blackout of a specific group?” The missing part of the news is knowing conflicts of interest may be operating in those who are controlling the message. Do they own shares in the development? What other reason might they have for this stance, in total disregard for the Truth and Reconciliation process? We’ve heard the truth as experienced by First Nations children and families. So now where’s the truth about those elements in our society which benefitted from the cultural genocide, and when will they be called out?